Just when you thought you’ve run out of adequate storage/floor space in your house, Simply Maid brings to you a couple of awesome ideas that will help organise your home better than ever! It’s all about utilising idle areas around the house and incorporating a few space-saving ideas for a neat and organised home. With that said, better organisation cannot be achieved without decluttering your home first. In other words, if you don’t get rid of unwanted items and rubbish that has been collecting over a period of time, organising and creating more storage space in your home is going to be a much tougher task! So, if you’re tired and frustrated with the lack of storage space and organisation in your home, here’s a golden opportunity to do something about it! 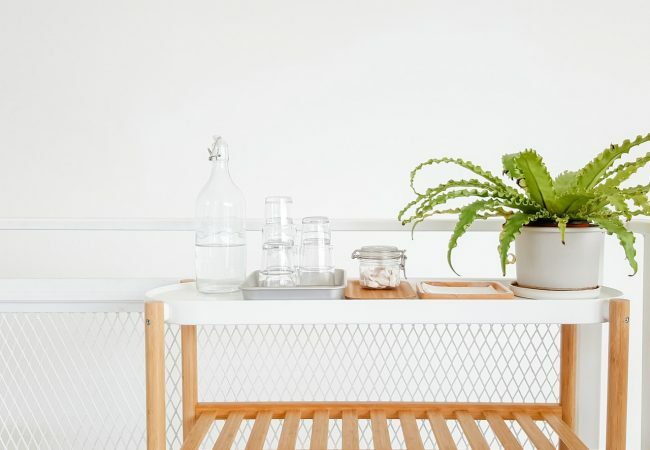 Read on to find out how you can organise your house with these space-saving ideas. Multifunctional Furniture for the Win! Less Floor Space? Add More Shelves! Cramped up floors look messy and are rather inconvenient because you can’t move around freely. Shelving solves this problem by freeing up floors and adding storage space at the same time! What’s more, there are so many design systems and practical uses for shelving which add style and functionality to your home. Floating shelves, which hang from decorative chains, are a great choice for making use of dead space in wardrobes; they hang from the ceiling and can be used to store small items. While it’s best to install shelving in convenient, easy-to-reach places, consider utilising idle walls that won’t obstruct walking paths in your house. Bring Dead Under-Stair Space to Life! If you’ve got stairs in your home, it’s likely that the space underneath isn’t being utilised as efficiently as it could be. Many homeowners tend to use this space as a dumping zone for random items such as umbrellas, mops, boots, etc. While it’s alright to store things here, it can be done in a much more organised manner. For example, hooks or wall mounted racks can be used for hanging up long items while an under-stair cabinet or shelving can be installed for storing less frequently used items. If you want to go in an entirely different direction, there are many other ways to use of dead under-stair space like turning it into a mini study for your kids! No matter what you’re trying to organise, compartmentalising plays a huge role in it! From drawer dividers and kitchen racks, to storage containers and bottles; these handy tools help you categorise items and store them neatly. Best of all, when you compartmentalise, it frees up more space that would typically be wasted by poor organisation. This principle holds true for various storage spaces in your home including dressers, wardrobes, cabinets, drawers and shelves. It’s also a great space-saving idea for organising your garage, basement and attic. Often times, these rooms are left in disorganised messes and hence, minimise the amount of space in them. Compartmentalising solves this problem once and for all! Look around the room and consider how much more space you could have if you rearranged furniture and made use of all the corners. More often than not, this is a clever way of making a room appear larger while opening up floor space. Typically, triangular shaped furniture is the best way to make use of corner spaces in the room; however, small pieces of furniture can also be placed in corners and create more space in the room. For example, a small, square shaped cabinet pushed against the walls at an angle will leave you with space on either side to place other items such as a lamp, plant or decorative floor ornament. That’s right, all it takes is incorporating these clever, space-saving ideas to organise your home better than ever! Keep Your Home Clean and Ready for Surprise Visitors! Next Post: A Pest-Free Home? Yes, Please! Previous Post: 10 Home Related Valentine’s Day Gifts for Someone You Love!